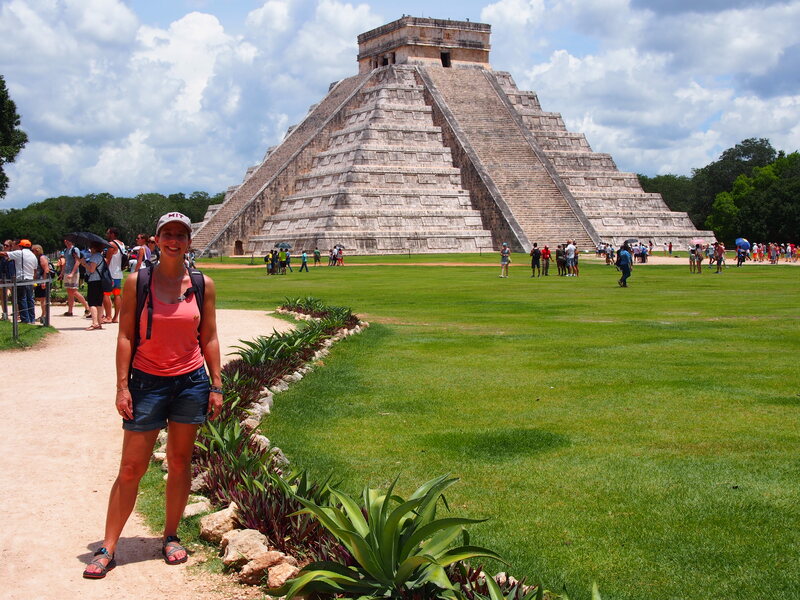 Chichen Itza, Merida and loads of Cenotes! Now that my study tour of the US is complete, I’m back to adventuring all over the world. I am currently touring with a childhood friend whom I haven’t seen in 25 years. We will spend the month of August touring Mexico, Guatemala and Belize on the Intrepid tour Mayan Highlights. It turns out that it’s actually a combo tour, so our current guide Edwin (who is Guatemalan) who is absolutely awesome will only be touring with us as far as Guatemala (the Intrepid tour for this portion would be called Explore Mexico and Guatemala, if booked separately). We arrived in Cancun in the evening of August 8th and set off to explore, first thing the next morning. Chichen Itza is one of the most famous Mayan ruins, Apparently the second most visited Mayan site in Mexico. I suspect the site is one of the most visited due to it’s proximity to Cancun, approximately three hours drive by bus. It was also named one of the new seven wonders of the world in 2007. Chichen Itza means “At the mouth of the well of Itza”. The town was built here because it provided access to some sink holes (cenotes) which are the only source of fresh water other than the rain, in the Yucatan Peninsula. 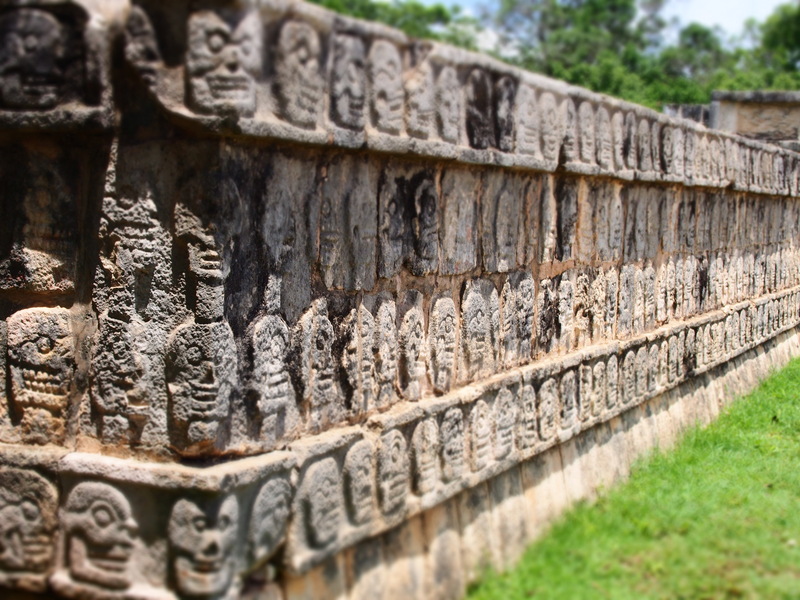 The most recognizable part of the archaeological site is the Temple of Kukulkan, otherwise know as El Castillo. It is a stepped pyramid with 9 terraces and 365 steps. The site was fascinating to visit, but I found that it was very busy, both with tourists and with locals selling their wares; also there weren’t all that many buildings to see. It’s also quite challenging to visit as there is little to no shade at the site and Mexico is HOT! Approximately 5-10 minutes by taxi down the road from Chichen Itza is the very popular cenote Ik Kil. Ik Kil is approximately 26 metres below ground level, 60 metres in diameter and roughly 40 metres deep. As the water is fresh and I am used to swimming in the sea I was surprised at how much effort it took to keep my head above water as I wasn’t buoyant. Due to it’s popularity it was crazy busy, but simply fantastic!! 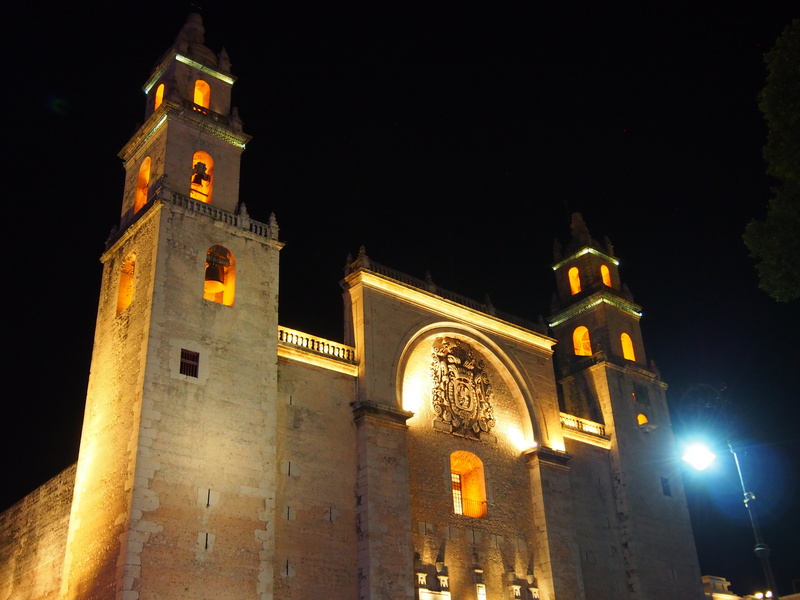 Merida is the capital city of the Yucatan state, and is roughly two hours from Chichen Itza. Due to my busy-ness exploring cenotes I didn’t spend much time exploring the town of Merida. The bits I saw were super cute and the people were very friendly. Since one of the reasons I wanted to visit Mexico was to see the cenotes, I did a day tour from Merida to the town of Cuzama, from which we were able to visit some cenotes. Once we arrived at the site we had a pretty interesting ride into the jungle. It was done in three legs. The first and third legs were with a very rudimentary four person train cart that was horse drawn along train tracks. The middle leg was also a four person transport method, but it was a motorbike tuk tuk type thing. The ride was so bumpy even the cheeks on your face would vibrate and flap up and down. It wasn’t particularly comfortable but it was quite the adventure!! The first cenote we visited was Bolonchojol, the name means nine holes for rats. There was only a small opening to get into the cenote and you had to climb a ladder down 15 metres to access it. The water was a crystal clear turquoise colour with some tree roots dropping through the ceiling into the water, not to mention beams of natural light. This was probably the most stunning of the cenotes. The added bonus was that we were the first group there and had it all to ourselves for a short time. The water temperature was perfect and it was such a peaceful place to visit. 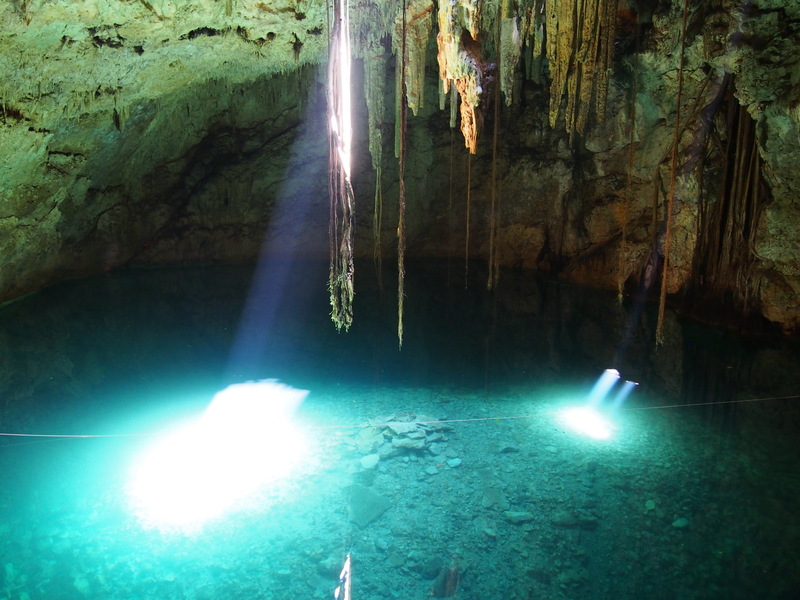 The second cenote was Chaceziniche, the name means rat ant for wood. It has a much larger opening allowing more natural light to enter, it is a 20 metres descent down a staircase and the water is roughly 27 metres deep. The water here was again a beautiful temperature and was 100% crystal clear, this time a deeper blue colour. This one also had more tree roots dropping into it. The third cenote was Uzil, little place. You entered it be climbing down a ladder between the roots of a tree. You descend into a pitch dark cave, and can swim a 30 metres stretch between the stalagmites and stalactites from north to south in this tiny cenote. 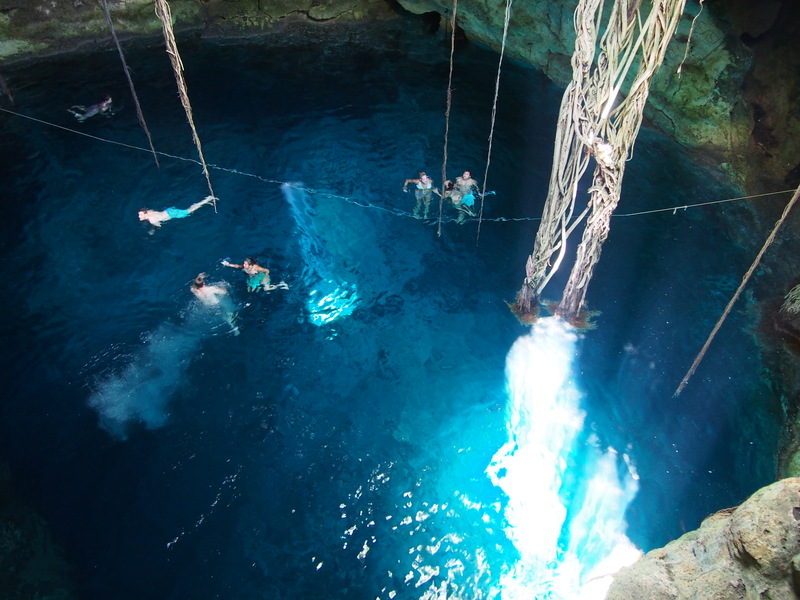 With no natural light, it is quite a bit colder than the other two cenotes, but quite a difference and exhilarating experience. Swimming in a dark cave. 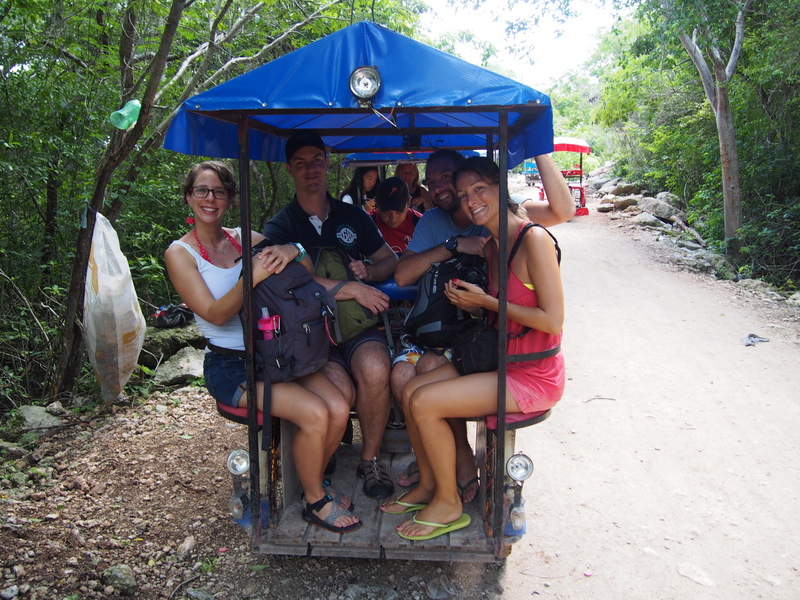 The cenotes were simply magnificent, and I had the most amazing day but if you have issues with animal cruelty, then I would perhaps not recommend this tour to you – I had no idea of the transport method, so was unaware of the cruelty to the horses that I would witness.